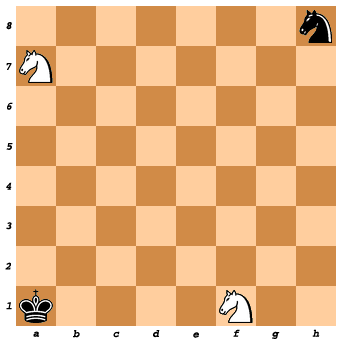 The black king has spent his life fighting over this strange checkered land, the white king has finally been defeated and his troops have surrendered and pledged allegiance to him. Now he's not sure what to do with himself, he decides to have a drink. But he is a king! He can't just have any normal drink that some lowly pawn might have. He demands a drink of exactly 2 litres be delivered to him! As quickly as possible! The knight on A7 is carrying a jug of capacity 7 litres, The knight on F1 is carrying a jug of capacity 11 litres. They both start empty. The black knight is a source of infinite water. The goal is to have 1 knight carrying exactly 2 litres of water and deliver it to the king. You can move any piece in any order, you don't have to go W,B,W,B etc. Not the answer you're looking for? Browse other questions tagged story optimization chess decanting-problems knight-moves or ask your own question.